By law, nearly 1,000 TV stations must move to new frequencies to make room for wireless services. Congress authorized the Federal Communications Commission (FCC) to auction off broadcast TV frequencies – or airwaves – to make more airwaves available for wireless services. The auction has concluded and now TV stations that did not participate in the auction will be required to move frequencies to make room for wireless companies that purchased the broadcast airwaves. TV stations will be required to move frequencies at different times starting in 2018 through at least through the spring of 2020. PBS39 has moved as part of the first phase of this process, making the change at 12:01 AM on Saturday, September 1. Yes. WFWA PBS39 made our move on Saturday, September 1 at 12:01 AM. WISE here in Fort Wayne also moved, but earlier on August 31. WANE and WFFT will be moving to their new frequencies in the fall of 2019. Remember: If you rely on an antenna to receive free, over-the-air TV you will need to rescan your TV after local stations move. Make sure you have an antenna connected to your TV. Select the MENU button on your television’s remote control. Select “Channel Setup” (or similar option). Select “New Scan” (or similar option, such as Tune or Autotune). That’s it! This process should take about 5-10 minutes and then you should be able to receive all four of PBS39’s channels (39.1, 39.2, 39.3 or 39.4) as you did before. Please note: The actual channel number that you see will not change – we will still be displayed as 39. It may take more than one time re-scanning to acquire the new signals. Depending on where you live and the type of antenna you use, you may have to re-position your antenna or rotate it up to 90 degrees to acquire the new signals. You do not need to hire someone to complete the rescanning for you. It is a relatively simple process. If you subscribe to a Pay-TV service – such as cable or satellite or live in a residence where they offer you TV service as part of your rental contract, – you do not need to do anything They should do the changing for you. If they do not, contact them and inform them of the error. You do not need to purchase new equipment or services. If you pay to subscribe to a television service – such as cable or satellite – you do not need to take action. Your service will take care of this for you. 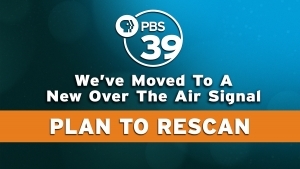 If you have been watching PBS39 using an antenna, you should still be able to watch PBS39. Rescanning is when your TV or converter box finds all of the available channels in your area. If you haven’t rescanned your TV recently, you may discover TV channels that you didn’t know you were missing. Are any stations going off the air permanently? Stations that participated in the auction are currently assessing their ability to continue broadcasting by sharing a channel with another station, but some may go off the air entirely. Each decision is being made based on the stations’ unique situation. PBS39 has not gone off the air or changed our programming on any of our channels. How will I know when my local stations are moving? Visit TVanswers.org for information on when other TV stations are scheduled to move to their new frequency’s. What does a station frequency move entail? In most cases this means changing the broadcast antenna which sits on top of their current tower. Other work includes modifying or replacing transmitters and antenna tower reinforcement. These changes are happening behind the scenes. You will still find your favorite stations, especially PBS39 (39.1, 39.2, 39.3 and 39.4) on the same channel numbers as before. Will my TV stations get new numbers? After you rescan your TV set, your local TV stations will still be found at their usual channel numbers. Including PBS39. Even though our new frequency is RF channel 18, your TV will still see all our channels as 39.1, 39.1, 39.3 and 39.4 after the rescan process completes for you. If I need help rescanning, who do I call? If you have difficulty, consult the owner’s manual for your television or converter box for more detailed instructions on how to run a channel scan, or contact customer service for your TV or converter box manufacturer. You should not need to purchase new equipment or services or hire someone to complete the rescanning for you. It is a relatively simple process. I lost my original TV remote, what do I do? If you cannot find the remote control for your television or converter box, try using your universal remote or buying one to rescan or check the TV for controls located on the side or back of the unit. If you do not see controls on the TV, contact your set manufacturer for assistance. Lacking all these options, you may have to manually program in channel 18.1, 18.2, 18.3 and 18.4 by hand, using the buttons on your TV set to do so. I rescanned my set as suggested and am still missing channels even after multiple attempts at rescanning. Does this mean I need to buy a new antenna? While most channels can be recovered by attempting an additional rescan, in a few cases, you may need to adjust your antenna manually. 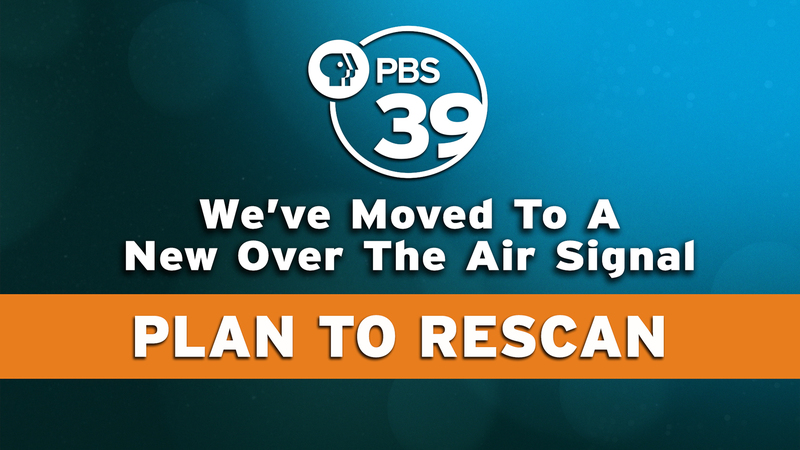 Viewers have told PBS39 that by rotating their antennas up to 90 degrees or changing the location of indoor antennas, they have been able to get our channels after rescanning. If you saw our signal before, you should still be able to see our signal. Please note: It is never a bad idea to inspect your cabling from the antenna to your TV and inspect your antenna or antennas to ensure they have not been damaged or that connections have come loose, especially if you have not done so in a while. Online list of local stations and when they will be moving – Please note that once you get to this web address, you’ll need to type in your zip code ato see which stations in your coverage area or community will be moving, and when. About The FCC Repack: From the FCC, explaining how we got to here and now.